We think Cooking Light Magazine said it best "Less fat -not no fat- means better flavor and texture. We like Cabot the best." 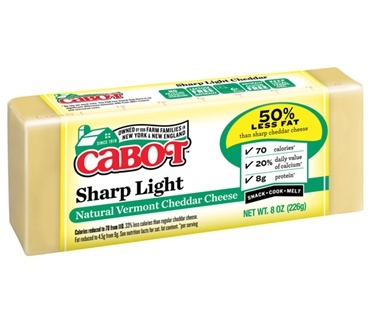 Cabot's Reduced Fat Cheddars keep winning in taste tests nationwide. Why? Because we know how to craft great cheddar. One 1-oz serving has just 70 calories and 4.5g fat. ON SALE! BUY 3 or MORE AND SAVE!! I Love Love Love this Cheese ! ! ! ! This chees has a lot of flavor and tastes great for a low fat option. Sometimes the low fat chesses are not that good and this has provided me with a great tasting option. I love cheese so am always looking for a healthy alternative to full fat versions. I love the Cabot line of reduced fat cheeses. Love 50% Reduced Fat Cheddar and have been eating it for years. Healthy, velvety and versatile. Delicious! Because of the reduced fat, the lack of animal rennet, the protein and the delicious taste, it is a frequent mini-meal or snack in my day. It's terrific in omelets, too! !